Craig Hamilton knows characters. His portraits of superheroes pare down each character to their most classic elements. 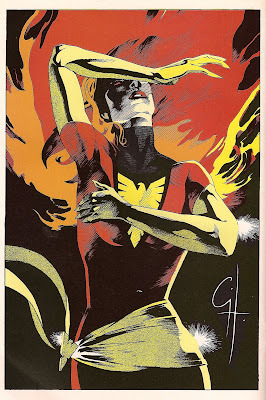 Take Dark Phoenix for instance. The dramatic arrangement of her arms is perfect for a character of her tumultuous history. The weight of her power bears down heavily on her as her fiery aureole majestically engulfs her. This is a woman consumed by her own intensity. Click on any of the images to view them larger! Then you can better enjoy Hamilton’s amazing linework! 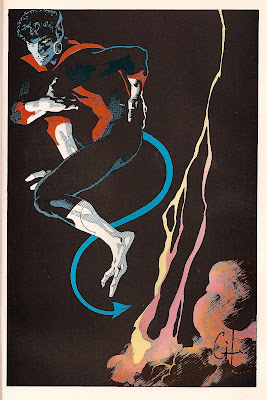 Nightcrawler is a charming man despite his unusual appearance. He channels his hero Errol Flynn in this image with a swashbuckler bent to his body language (The hoop earring is also a nice touch). I love the added detail of the fading smoke from his recent teleportation. 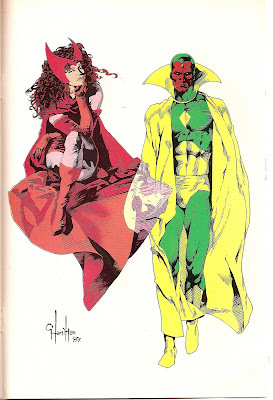 The Scarlet Witch and the Vision used to be quite the power couple before a few dismantlements (him) and mental breakdowns (her) left their relationship in shambles. I prefer to think of these characters in their classic forms from this time. Wanda is looking confident but contemplative (a far cry from her recent depictions) and the Vision stares with glowing eyes that reveal his android nature. I love that Hamilton chose to emphasize the etherealness of both characters by having Wanda floating and the Vision phasing. 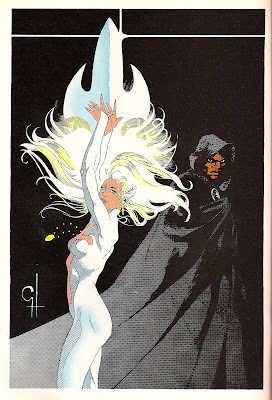 Hamilton’s version of Cloak and Dagger is stunning, truly representing the core essences of Tandy and Tyrone’s struggle with their respective super-powered polarities. Lockheed hovers above the intangible Kitty Pryde (Shadowcat). Kitty has always struggled with a costume that works for her and most people do not refer to her by her Shadowcat codename since she has gone through so many, so it seems appropriate to have her depicted in regular clothes for her portrait. 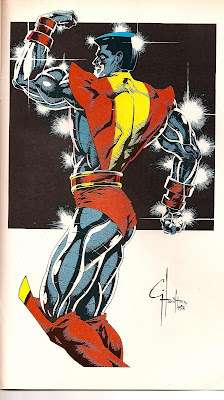 Colossus shows off his organic steel muscle definition in a rare display of exhibitionism. Usually, Piotr is quiet and reserved, slow to anger but a powerhouse when tested. Colossus (alongside Nightcrawler and Storm) are among the most unique and iconic of the All-New, All-Different character designs. Ka-Zar, Shanna the She-Devil and Zabu relax in their Savage Land home. There’s a little something for everyone in this amazing illustration. Ka-Zar isn’t usually depicted so beefy, but I have no complaints. Everything about this piece from character to composition works for me. 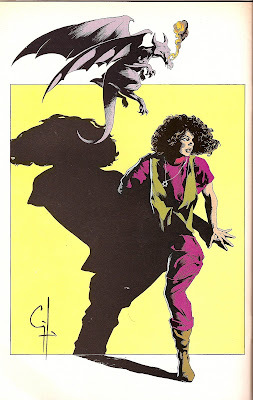 I saved my favorite for last because it showcases everything I love about Craig Hamilton’s work. Not only is he true to the characters’ designs and histories, he creates the most beautiful arrangements in which to place them. The multiple layers of setting (rain on the window, the windowpanes, the figures,the fabric & the smoke from the incense burner) give the artwork depth and density which an esoteric character like Doctor Strange really needs. Also, Hamilton excels at presenting the natures of the relationships of characters to one another. 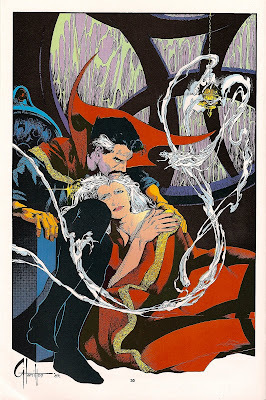 Clea is Doctor Strange’s disciple, but she is also his lover. Even if this is your first time viewing these characters you can tell that they have something very special together. The spotlight shines on another amazing artist on next week’s Marvel Fanfare Monday!